It’s been yet another disappointing year for Collingwood and the Gold Coast. Both came into season 2016 with high hopes with many tipping the Magpies to push for a top 4 spot and the Suns to push for a spot in the finals. Early on it was obvious neither were achieving their goals as they took loss after loss, both on field and in terms of personnel. That may be the biggest story of 2016 for these two promising young lists, injuries. The Magpies have been hit hard with talented players like Swan, Elliott, Reid, Fasolo, Ramsay and Scharenberg all missing plenty of games. The Suns once again have also had an injury curse befall them with names like Ablett, Rischitelli, Swallow, O’Meara and McKenzie missing large chunks of the season. But while injuries have definitely effected both teams ability to perform, to come into a round 22 matchup with a combined record of 14-26 simply isn’t good enough given the talent of their respective lists. One team will get some redemption on Saturday night though when the two face off at Etihad Stadium in Melbourne. 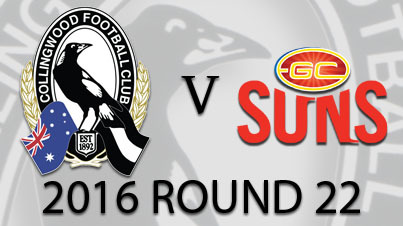 It’s the second last game of the season with both the Pies and Suns coming off close losses last week. The difference in those losses is extreme though. While the Magpies were commendable for their fight and effort against a finals side, the Suns were condemned and ridiculed for their loss to Essendon, who had previously only won one game. Prior to last weekend though the Suns had shown some good signs with wins over Fremantle and Brisbane and close losses to GWS and Melbourne. That loss to the Bombers is unforgivable though, and the only way to redeem themselves is to put up a better effort against another non finalist on Saturday night. 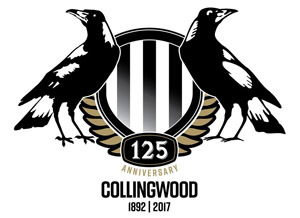 As the Magpies come close to the end of another wasted year it’s hard not to look at the negatives that have occurred and the reasons for the failure. But there are positives and two of those are Brodie Grundy and Darcy Moore. Grundy, entrusted with the number one ruck role has matured into an AFL class ruckman in just his fourth season. At just 22 years old the big South Australian looks at home already where most ruckman don’t hit their strides until at least their mid 20’s. With a career high 47 hitouts last week (to improve upon the 45 against the Eagles a few weeks back) Grundy is now the ruckman that the Pies can trust going forward. Talking about forward, and young forwards, and you have Darcy Moore, who in just his second season needs just 2 more goals to win Collingwood’s goal kicking award for the season. Moore also has put up big numbers against the Dogs and Eagles with 11 scoring shots in those two games. In these two players the Pies may well have the best young ruckman and best young tall forward in the game. The biggest positive at the club at the moment though may not be at senior level at all, it’s in the reserves. The Magpies VFL team has now won 11 games in a row and with 2 games remaining only needs one win to secure a top 2 spot and a home final. In the 11th win in a row last weekend, over Port Melbourne at Victoria Park, there were several standouts. Travis Cloke, the most talked about reserves play in Australian sport at the moment kicked 5 goals and if the Pies are picking a side on form he should play seniors this week. The defense held up magnificently though and this was mainly due to three senior listed players, Frost, Williams and Toovey. Williams was the standout and was especially brilliant in the final term when the opposition were attacking with a wind advantage. 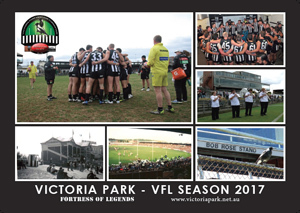 At least Magpies fans will see finals this year, even if it is only at VFL level. As for the game against the Suns, all Pies fans will want to see is a repeat of the effort that was put forward against the Dogs. That effort along with the talent on the field should see the Pies notch their 9th and probably final win of season 2016. The Gold Coast Suns were supposed to make a dramatic move up the ladder this year. After finishing in 16th spot with only 4 wins in 2015 many were predicting the Suns would even play finals this season. They started the season well too with 3 straight wins and all of a sudden it seemed these young Suns would mature into a competitive team. Since then though they’ve only won 3 more games and are once again sitting in the bottom third of the AFL ladder. Of course there’s been extreme injury problems on the Gold Coast but a probable finish of 6-16 for the year isn’t the return the club, or the AFL world were expecting. The problems have really all stemmed from the injuries to the midfield this season for the Suns. If you look at their best possible lineup, this week they will be missing Ablett, Rischitelli, Swallow, Prestia, Nicholls and O’Meara from their central core. That’s a massive list of outs and shows why they rank last for clearances this season. In their absence it’s been left up to a rag tag group of kids and experienced depth players to fill the gap. 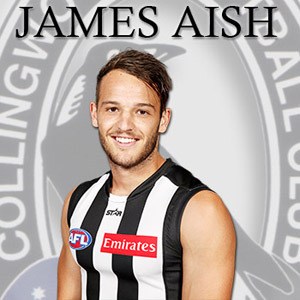 Hall, Hallahan, Shaw, Martin and Miller will likely make up the midfield against the Pies and that makes it an almost impossible task to match the star studded lineup that Collingwood will field. It is hard to see the Suns beating a Collingwood midfield that includes Pendlebury, Treloar, Sidebottom, Greenwood, Grundy, Aish and Crisp. If this Gold Coast team has a strength it’s their forward line. Despite having one of the lowest inside forward 50 entry rates in the AFL the Suns have still managed to out score five teams for total points this season. Add to that the lack of production from their midfield and this forward line has the promise to carry this team for years to come. The star of course is Tom Lynch, who in a struggling side is amazingly still a chance of winning the Coleman medal. With 63 goals from 20 games Lynch is a bona fide star of the AFL. He has some support too with Day, Wright, Matera, Grant and Martin all able to impact the scoreboard. The Suns forwards may be able to stretch a Magpie defense that is now missing Reid, Ramsay, Scharenberg and Langdon from it’s first choice lineup, if they can get the ball inside forward 50 enough of course. The Suns backline has held up pretty well most weeks considering the beating out of the middle the team has been getting. Stephen May and Rory Thompson lead the way down back although they would love the experienced Nick Malceski to return this week. Malceski will have to pass a fitness test to take on the Pies so it won’t be known for a few days if he’s available. The Suns back line hasn’t been as injury hit as the rest of the ground but the absence of Trent McKenzie is hurting their rebound ability. The positive for the Suns defense is they run into a dysfunctional Magpies forward line that itself has been hit by injuries. With no Fasolo, Elliott, Swan and probably Cloke (not injured obviously) the Suns will only have to restrict the output of young star Darcy Moore to have an impact here. The Suns will want to bounce back from one of their worst performances in club history last weekend. The loss to Essendon will leave a bitter taste in the mouth and with the team staying in Melbourne for the entire week they will prepare for this game like a mini final. It is important to finish this season on a high and this may be the best chance the Suns have of doing that. Even with the expected increase in effort from the Suns after last week’s embarrassing loss Collingwood should simply win this game. The midfield is where the problem is for Gold Coast and it’s hard to see how they can match it with the Pies stars in the middle. It’s a small advantage to the Suns that this game is at Etihad Stadium and not the MCG but in the end that should count for little and the Pies should win quite easily.